Focal segmental glomerulosclerosis (FSGS) is one of the most common glomerular syndromes and leads to chronic kidney disease (CKD). FSGS is characterized by podocyte dysfunction and is often linked to environmental toxins, infection, and inflammation. Increasing evidence indicates that there is also a genetic component to the disease; however, highly penetrant disease genes have been identified only in a small fraction of patients with a family history of FSGS. Haiyang Yu, Mykyta Artomov, Sebastian Brähler and colleagues performed high-throughput sequencing of 214 FSGS patients of northern European ancestry and focused on 2500 genes that are highly or specifically expressed in podocytes to identify new FSGS disease susceptibility genes. In addition to the 20 known genetic FSGS-associated variants, the authors identified 9 new candidate susceptibility genes. Moreover, the authors developed a high-throughput mouse model that allows inducible shRNA-targeting of candidate genes specifically in the kidney of adult FSGS-susceptible mice. Yu and colleague evaluated their 9 FSGS candidate genes in this model and validated 3 of them (KANK1, WNK4, and ARHGEF17) as FSGS disease genes. Together, these findings support a broader role for genetic susceptibility to FSGS than has been previously appreciated. 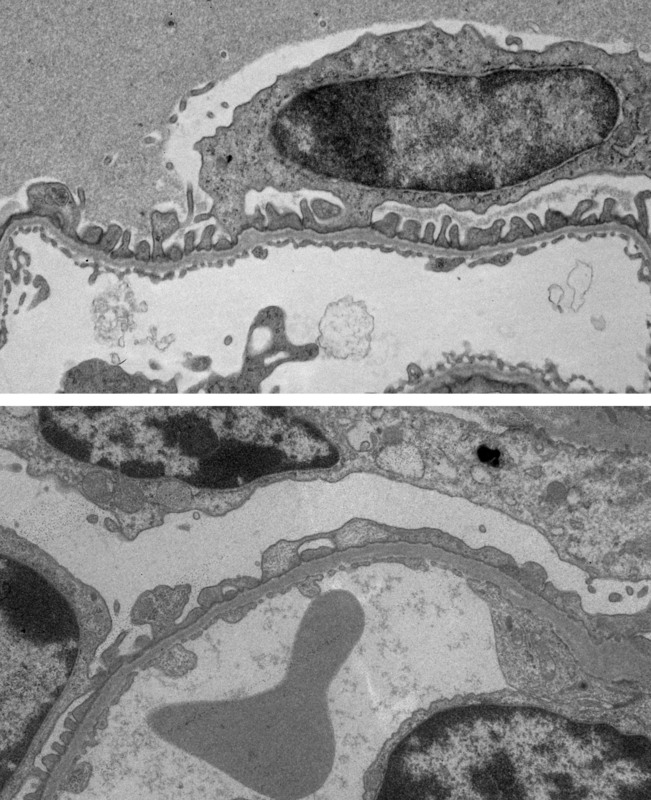 The accompanying image shows electron micrographs of a control mouse (top) and a Cd2ap RNAi mouse that has been treated with doxycycline (bottom). Note the podocyte foot process effacement in the Cd2ap RNAi mouse compared to the normal podocyte architecture in the control animal. Citation Information: J Clin Invest. 2016;126(3):1067-1078. https://doi.org/10.1172/JCI82592. Focal segmental glomerulosclerosis (FSGS) is a syndrome that involves kidney podocyte dysfunction and causes chronic kidney disease. Multiple factors including chemical toxicity, inflammation, and infection underlie FSGS; however, highly penetrant disease genes have been identified in a small fraction of patients with a family history of FSGS. Variants of apolipoprotein L1 (APOL1) have been linked to FSGS in African Americans with HIV or hypertension, supporting the proposal that genetic factors enhance FSGS susceptibility. Here, we used sequencing to investigate whether genetics plays a role in the majority of FSGS cases that are identified as primary or sporadic FSGS and have no known cause. Given the limited number of biopsy-proven cases with ethnically matched controls, we devised an analytic strategy to identify and rank potential candidate genes and used an animal model for validation. Nine candidate FSGS susceptibility genes were identified in our patient cohort, and three were validated using a high-throughput mouse method that we developed. Specifically, we introduced a podocyte-specific, doxycycline-inducible transactivator into a murine embryonic stem cell line with an FSGS-susceptible genetic background that allows shRNA-mediated targeting of candidate genes in the adult kidney. Our analysis supports a broader role for genetic susceptibility of both sporadic and familial cases of FSGS and provides a tool to rapidly evaluate candidate FSGS-associated genes.